The Romans loved all forms of entertainment. Sports contests, chariot races, gladiators and live theater were all very popular. They even played football! Plays were performed during religious ceremonies, to honor the gods. Since Rome had over 200 religious days every year, it was possible to see a play on almost any day. There were hundreds of playwrights in ancient Rome, and some were quite famous. Since the actors were professional and did receive pay, someone had to pay to sponsor the play. As a way to honor the gods, some wealthy noble would pay for the play and then allow people to come and watch the play for free. Since every town had a forum, which was used as an open air market, this was usually where the stage for the play was erected. The stages were made of wood and had little or no scenery backdrop. Under the empire, stone theatres were built as well, with room for large audiences. Plays performed in the big theatres were also free. The actors were always men until empire times. Under the empire, there were a few female actresses who performed on major stages, in the stone theatres. Since an actor might have to play several parts, costumes were worn over other clothes, and were easy to get on and off. To help the audience understand what was going on, and the mood the actor was portraying in the play, the actors would hold up happy or sad faces. 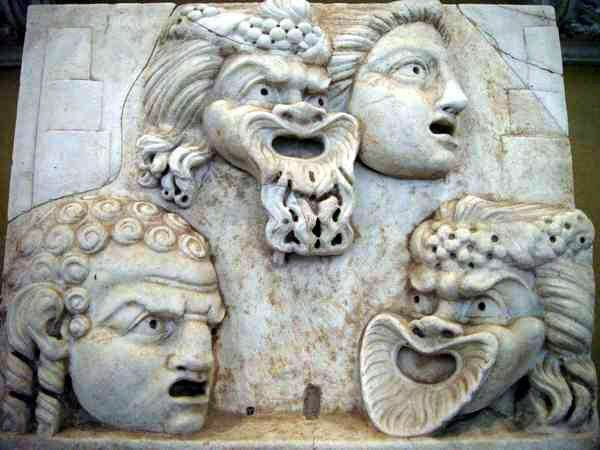 Roman actors developed the art of pantomime or acting without words. They also used dance, music, elaborate gestures, sets, and costumes to get across the meaning. As theatre developed, they sometimes had elaborate sets. Much of this was done because, whether watching a play in the forum or in the big stone open-air theatres, the ancient Romans felt free to talk out loud during a play. The Romans would discuss what was going on in the play with their neighbors. They might compare it to last years' play or even discuss business and weather during the play. The audience would also voice their displeasure if they did not like the play. They might even throw food, sticks, or even stones at the actors. Acting in Rome could be dangerous. In ancient Rome, acting was considered just above begging as an occupation. There were a few exceptions to this, but for the most part, actors were not well paid.